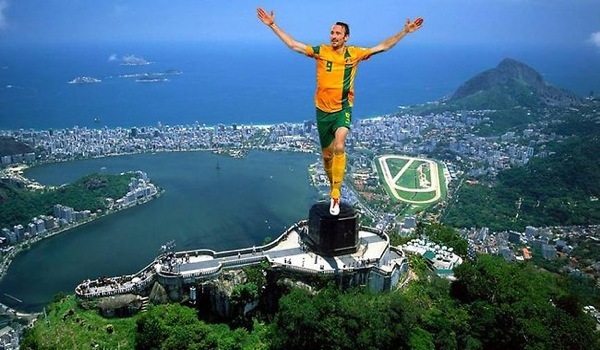 Australian soccer legend, Joshua Blake "Josh" Kennedy, better known by fans as "Jesus" replaces the statue of Christ in Rio de Janeiro. (Images from Wikimedia Commons). Brazil's mining sector is expected to see slower average growth rates through 2018 compared with previous years, as China —the main consumer of the South American country’s iron ore— seems to be in the midst of a property bubble, and if construction stops, the world demand for the steel-making material will plummet. In its recently released Brazil’s Mining sector report, research firm Business Monitor predicts production gains for both domestic and foreign producers, with iron ore driving investment in the sector. While iron ore prices have recovered after slumping 8% in a single day to a 17-month trough last month as steel prices plunged, the fragile outlook for steel consumption in China and towering port stocks mean the steel making ingredient remains vulnerable to another rout. And since iron ore makes up around 85% of the Brazil’s total mining export value, a slowdown in China will have a significant impact in the country’s mining industry, the report shows. Iron ore production in Brazil, home to world’s largest producer of the commodity, Rio de Janeiro-based Vale (NYSE:VALE), is expected to average US$115/tonne this year and $105/tonne in 2015, lowering the value per unit of mined output. Still, Business Monitor expects China to remain the nation’s top customer, as Vale increases output given both that its cash costs range between $30-50 per tonne and shipping costs to China, while comparatively more expensive than iron ore from Australia, remain competitive. Alongside Vale, the analysts expect other foreign and domestic firms to continue investing in Brazil’s iron ore sector. Anglo American (LON:AAL) is still working to bring its $8.8bn Minas Rio project online, which is scheduled to produce 26.5 mn tonnes per annum, beginning next year. On the domestic front, Companhia Siderúrgica Nacional (CSN), a steelmaker, is further developing its upstream supply of iron ore. According to the report, this is providing an opportunity for both fuller vertical integration in its domestic steel operations and for increasing iron ore exports abroad. Usiminas, another major Brazilian steelmaker, is aiming to bring its annual output of iron ore to 29mnt in 2015. And Centaurus Metals began production at its Jambreiro mine at the end of last year, with an annual production estimate of 2mnt. The experts warn Brazil’s iron miners risk losing market share to Australian competitors such as BHP Billiton, Rio Tinto, and Fortescue Metals in the coming years. Down Under, says Business Monitor, has a significant geographic advantage due to its far shorter shipping times and smaller costs. 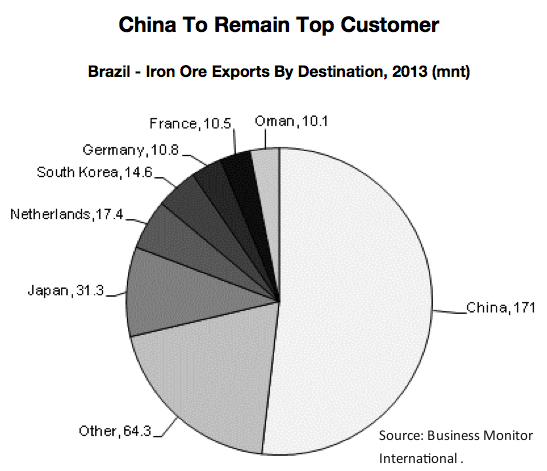 This could explain why Australian iron ore exports to China grew far faster in 2013 at nearly 19%. The outlook doesn’t look promising, the authors say, as the Chinese government recently extended its ban on Vale's Valemax fleet, primarily built to increase iron ore export volumes from Brazil to Beijing.